Every writer has their own process to develop a novel. 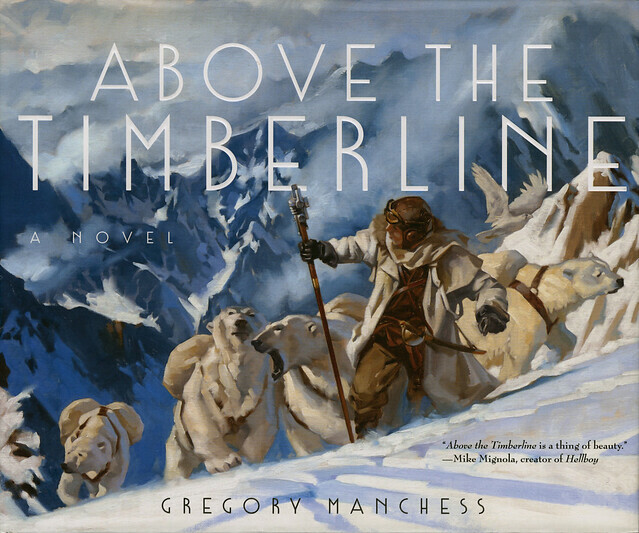 But for writer/illustrator Gregory Manchess, the process for creating his visual-rich novel Above the Timberline was something rare, arresting, and inspiring. I created the painting on-camera for a documentary about how I work as a freelance illustrator. I know the power of a strong image, how it inspires, how it drives a narrative. That images tell fast what words can only catch up to. Creating work that makes people curious is probably the most compelling thing to offer them. A picture is it’s own reference, and makes ‘a thousand words’ superfluous. Paintings don’t tell. They show. They build curiosity because we come to them with half the story already. Through our experiences. A quick visual read, “Above The Timberline” is a man-against-the-elements kind of image, with a slight twist. His pack animals are polar bears. Why is he out there and how does he manage these man-hunting killers? What is he looking for? Even more, ‘what was I trying to get across,’ ‘who is this guy,’ etc. These are the questions put to me after I completed the image in late 2009. I’d written things my entire life. Children’s stories, articles on the illustration business, poetry, philosophical thoughts about painting, and outlines for film ideas. Could I build a book that combined imagery with words to tell a visual story? Why not write a few thousand words across a hundred paintings? I hadn’t set out to do this with Above The Timberline, but now I challenged myself to write the story-behind-the-story already inherent in the painting. A story that describes without description. Explains without explanation. Tells without telling. I wasn’t after a graphic novel. Word balloons clutter the simple clarity a good image can depict. I don’t need to know what a character is accurately thinking because no one thinks accurately. I don’t need countless panels to depict time like film sequences. I wanted a simple, clear, direct passage of storytelling that pulls the reader along with curiosity and payoff. I’d read books that inspired me to build words and images together: Dutch Treat, Gnomes, a Japanese story from the 1600’s with panel pictures and words. Then James Gurney’s fascinating Dinotopia came along. Turns out he’d been looking at many of the same books and feeling the desire to tell his own stories, too. He got his chance when he painted a compelling image that opened a world for him. I knew an ex book-buyer, Joe Monti, who became a literary agent and I told him about my idea. He was intrigued, and challenged me further. How much story could I tell in how many paintings over what length. And of course, ‘how are you going to get this done?’ I had no idea. But I looked to my experience in illustration for clues. 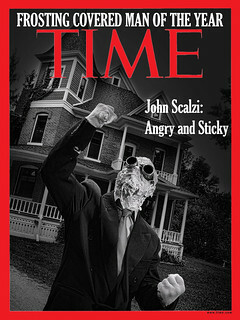 Illustration has incredibly short deadlines, with fast turn-around times for advertising or editorial assignments. An illustrator trains to work under pressure on multiple assignments with multiple clients at the same time. To not only hit those deadlines, but be effective, maybe even award-winning, each time. It’s a skill developed over years. And I had 35+ years at it. To accomplish the feat, I started with very small, postage-sized thumbnail sketches. These gave me story scenes that I wrote. The scenes gave me more image ideas, which gave me more scenes, and so on. I finally sat down and wrote a 300-page novel. Then I did something inconceivable for a writer. I stripped it of all description. The images would carry that load, thereby paring it down to about 10,000 words. I worked those ideas into sketches. Sketches came and went, sequences appeared and drifted away. Images revised words, and words revised images. The process wan’t a linear sequence, so my story swung to past events and current events with ease. I knew the reader would be able to go wherever I took them because we all drift backwards and forwards in time. Our thoughts make sense to us even if they’re scattered and random. The brain keeps them all arranged in an overall through-line, based on understanding, not logic. I worked to maintain one overriding theorem: give every page visual impact, but with words to express what a painting cannot say, and images to show what words cannot easily convey. Six years of writing and sketching, planning, revising and designing, and the book idea was sold. Eleven months and 122 paintings later, Above The Timberline was complete. I had found my portal, like opening a wardrobe door, and stepping into a world of snow. It was brutally cold, and oddly comforting. The warmest place I’d known in years. See a preview. Visit the author’s site. Follow him on Facebook. What are polar bears doing above the timberline, anyway? They’re marine creatures. (Ursus maritimus.) No wonder they don’t look happy. Those illustrations will drive me the buy this book. Thanks. I really like the look of the art in this book. I’m looking forward to checking this one out. 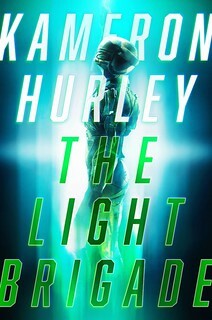 Great high concept visually and you can tell it’s a labor of love. The preview video of how the paintings are made look gorgeous! What beautiful art! The style, to me, is quite reminiscent of 1920s-30s illustrators. Fantastic! I’ve been awaiting this for months and ordered it ten days ago. It’s interesting to hear how it came to be. That cover image is so striking, it made me think, “Man, if the book is anything like the cover, I’ll buy it,” back when I still thought this was going to be an ordinary novel. So now, having read the rest of this post, Amazon is shipping the hardcover to me. I can’t wait to read it. Tor.com offered this image of the bears, the man, and the owl as wallpaper for the computer many years ago when they were launching their website and the Manchess image is the one I have kept on my computer since then. I love the assumed cooperation between the beings in the image (I just looked at the image on this page and the bird looks like a white raven here, but on my screen at home it is an owl). I am looking forward to the story. I met Greg Manchess at a Boston SF convention a few years back. I couldn’t resist – even though it was a splurge I bought one of his small astronaut paintings. It’s hanging right in front of my desk as I type this, a source of infinite wonder. Man is a GENIUS. My publisher (Odyssey Books, which includes the brand new Publisher Obscura imprint) reckons visual books for adults are the next big thing. She just might be right. I got an oversized postcard-sized print of the cover image at Spectrum a few years ago, and love it, so of course when I first heard a book was in the works I followed it’s progress as best I could until I could pre-order it. It came yesterday and is wonderful. This looks wonderful, definitely on my must get list. Is that a gyrfalcon in the last image? I will definitely check this out – it looks amazing!